Most users that are more familiar with Windows or other GUI based operating systems, don’t like command line. Or console. Or both. Great thing that there’s QT based open source applications then in this case. 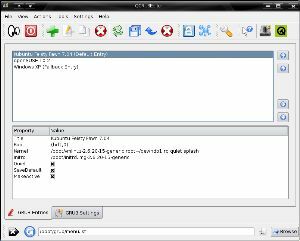 Such as QGRUBEditor. What it does, is it allows you to edit the GRUB configuration. Don’t know what GRUB is? It’s basically the way most flavors of linux now use as a bootloader. Still don’t know what it is? Don’t worry about it. Requires QT4 and Imagemagick it seems. Otherwise, you should be golden.